The Calhoun County Journal / Herald is published every week by Dudley Printing, Inc. The Calhoun County Journal-Herald is a combination of two papers - The Manson Journal and the Pomeroy Herald. The Manson Journal dates back to 1874 and the Pomeroy Herald to the 1890’s. The Manson Journal was established in 1874 by the Long Brothers and eventually merged with the town’s two other newspapers - The Manson Press and The Manson Democrat. The Manson Journal was later owned and operated by longtime editor and publisher Lloyd Jones until purchased by Gary Dudley of Dudley Printing in 1986. The newspaper acquired The Pomeroy Herald from Bob and Wanda George in 1987 to become The Calhoun County Journal-Herald which is the official newspaper for the communities of Manson and Pomeroy and serves Calhoun, Southern Pocahontas and Western Webster Counties. 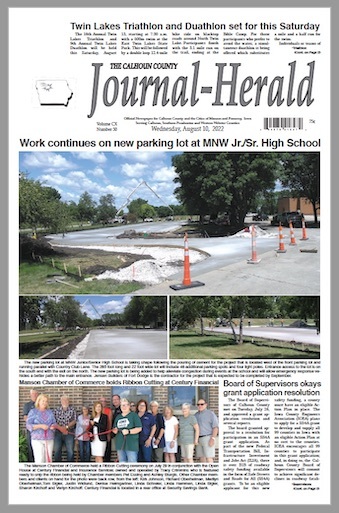 Publisher Jason Major acquired the Journal-Herald and Dudley Printing from Gary Dudley in 2016.